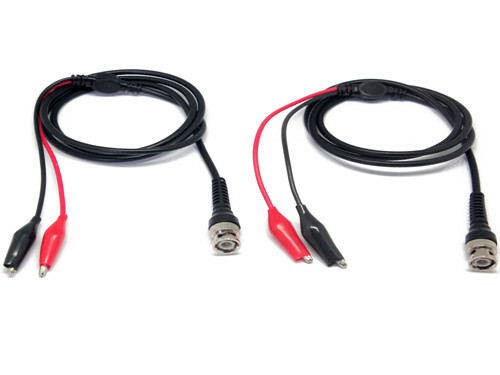 BNC Cable breakouts to Insulated Alligator Test Clips for test versatility. BNC connector and breakout wires are molded directly to the cable for added pull strength. Schematic: Black Alligator to BNC Shell, Red Alligator to BNC Center Contact. Breakout Wires: 20 AWG Stranding 41 x 36 t. c., PVC Insulated, .087" (2,21 mm) O.D. Operating Temperature: 50�C (+122�F) Max. Operating Voltage: 150 VAC Max.